Reminiscent of those dreadful British school-dinner curries of the 80s and akin to the sort of curry sauce that is poured over chips in the UK or currywurst in Germany, at first glance Japanese curry is mild, bland and, to some at least, inoffensive to the point of being offensive. That may all seem a tad harsh, but the comparison is far from unjustified, especially when you consider that curry was first introduced to Japan by the British (of all people) in the early 1900s! With that in mind however, it is all too easy to be unduly disparaging about Japanese curry and you shouldn’t, as it is actually quite delicious. Generally speaking, in Japan karē is served as a sauce (sōsu) rather than a curry made with meat, so you are unlikely to find a chicken or beef curry per se. You are of course welcome to add some meat to the curry sauce as it cooks, but I prefer to pour it over a crisp crumbed cutlet (tonkatsu/chikenkatsu) or add it to a pile of gyūdon. Typically eaten with rice or udon noodles, karē is so popular it is considered one of Japan’s national dishes and is readily available throughout the country, both at specialist restaurants or as an option on menus at most gyūdon or noodle joints. What sets karē apart from other curries is the fact that it is made with a roux, which enriches and thickens sauce. There are a wide range of Japanese curry/roux cubes available at most Asian supermarkets and these are well worth the expense as they are really the only specialist ingredient in the karē sōsu. 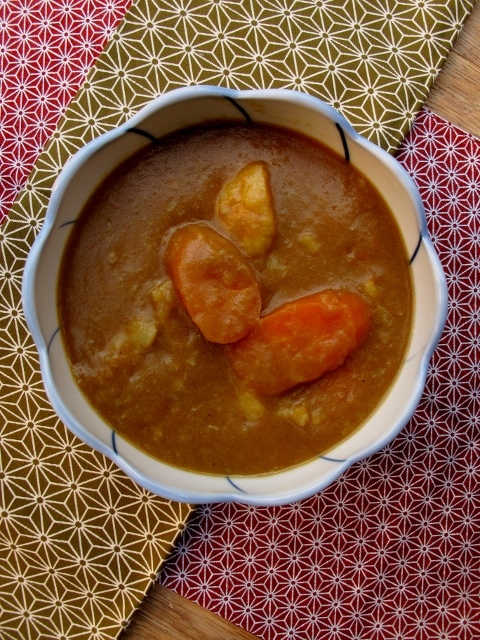 Alternatively, you can use Japanese curry powder instead. If, however, neither of these are available you can just use a mild curry powder, but the flavour won’t be as authentic.